This is not what we could call a "genuine" choice in the subject, but the literary result of a convenient offer from the director of BAA, a company which manages Heathrow's Airport (the so-called Terminal 5). 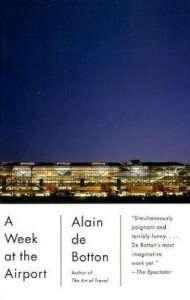 He in fact has proposed to Alain De Botton a one week stay in the airport to allow to his Terminal a sort of literary lustre. Officialy, the director has said that "the world has many aspects that maybe only a writer could describe with the right words". So the candidate is Alain De Botton, and he accepts the offer with enthusiasm. Actually a potential sociological experiment like this would excite me too, especially if paid in advance. 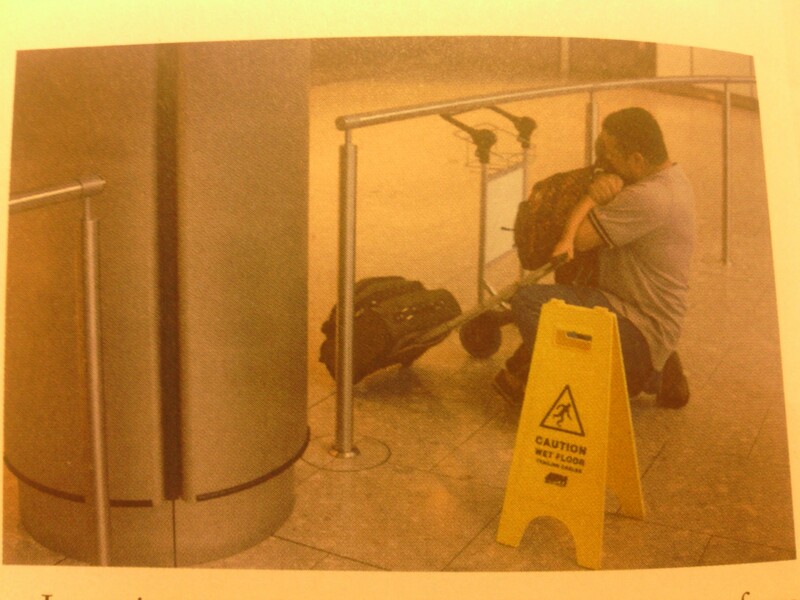 Botton, as typical of his production if I well understood, takes his philosophical inclination and competences to sink them into the everyday life, showing us in this case what an airport could reveal about not only itself, but also about the stories, emotions and moods of his passengers. Walking through the path of an hypotetical passenger, he divides his book in four moments: departures, check in, beyond the check in and then arrivals. He explores the characteristic of the territories like an enthusiastic Dora the explorer, getting excited for the room service and phraising the writer of his menu like he were a refined poet capable of competing with Matsuo Basho, the "king" of haiku, or phraising too the very pragmatic architecture of the Airport which reveals a sort of "prudish umilty", given the efforts it has secretly to do to support the structure (...what a patron can inspire to his artist..!) or saying passionately, during his dinner in a restaurant of the business class, that whatever has done the humanity come to that point, it was absolutely worth it (oh God, Patrick Bateman's spirit has definitely taken him!). I'm uncertain between judging it as a sincerely positive attitude and as a light but evident flattery. Without being too distrustful, I can say in his defence that he surely demonstrates a general will of searching mainly the positive angles of Terminal 5, if related to an emotional and philosophical reinterpretation. Like we could do with a dear friend. You will not find a single critic towards Terminal 5. Even the clear distress of the workers are told with a sympathetic and comprehensive disposition, and the same with the clients and their moods, like an ancient roman writer in the Urbe (for example Orazio and his tiny portraits of roman citizens in everyday life with all their humanity),. Also the rielaboration of the idea of a journey as the illusion of finding happines elsewhere but here, the moment when hopes are high and the delicious unknown makes us full of life and expectations was right and nice, but not surely brilliant and marking. In fact I don't know how much I will remember of this light and brief book a month from now, but even if it was pleasant to read, it is clearly destined to be forgotten soon in my mind. Sorry, Alain. I've read that some critics doesn't like him "because he tends to state the obvious and he's a bit pompous and lacking focus". I agree partly, he doesn't say anything new, but sometimes also little thoughts about our everyday life can pop up like things we were forgetting, immersed in this or that mood to be always focused on the "obvious statements about life". For example, I liked how he quoted Seneca remembering how sometimes anger comes from a constant and incurable hope. Following his point of view, we get too angry sometimes because "we are too optimistic and not prepared to the endemic frustrations of existence". You can't shout every time that you lose your keys.